Looking for tuxedo cat gifts? Look no further. Here you will find several gift ideas that will please tuxedo cat lovers in particular and all cat lovers in general. These gorgeous black and white cats have a very distinctive coat pattern. They look as if they are wearing a tuxedo. Interestingly, not all black and white cats are tuxedos. They must have solid throughout their bodies and white in just a few specific places. Needless to say, these elegant felines make great pets. Visit our tuxedo cats page to learn more. -- T-Shirts. Buy or create your own t-shirt depicting tuxedo cats. Many online stores give you this option. This is in fact one of the gifts you can easily personalize. And if you need more personalized gift ideas, see below. -- Plush toys. If you can’t give a real tuxedo cat, give a plush one instead. You can even find lifelike versions. -- Calendars. Tuxedos have graced many a calendar. You can find a wide selection at affordable prices. -- Old Possum’s Book of Practical Cats by T.S. Eliot. It is in this book that we’re first introduced to the “Jellicle cats” (a clan of black and white cats). And Cats, the Musical by Andrew Lloyd Webber, makes a great gift for music lovers. Memory is one of my favorite songs. 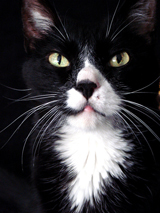 By the way, if you are looking for a name for your tuxedo, visit our tuxedo cat names page. If you want to give a unique gift, consider giving customized gifts or making your own. Several online stores allow you to upload your own images and pictures or choose from a selection of designs. You can personalize different items, including calendars, mugs, t-shirts, caps, mouse pads, aprons, and much more. These make fun gifts indeed. If you enjoy doing arts and crafts projects, make your own tuxedo cat inspired gift. For instance: you can take a photograph of your tuxedo cat, make a drawing, or a doll, and give any of these items as a gift.